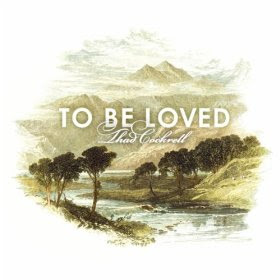 I recently picked up Thad Cockrell's latest album, To Be Loved. Consider me hooked. Folk/Americana/pop. Lyrics that communicate meaningful values, faith and truth in relationships. The album opens with the track "Pride (Won't Get Us Where We're Going)," a song whose title is its message. I obviously like the song "Look Up Sarah," not only because I can claim it as "my" Thad Cockrell song, but because it has a happy, easy groove that is fun and celebratory in a laid-back, understated way. Hit "Rosalyn" is radio-ready but sticks with me because of this uplifting line: "No matter how small the flame against the darkness, don't you know the light will win." And the shuffling, country-esque tune "He Set Me Free" is a straightforward declaration of redemption. Apparently Jars of Clay (a band whose debut album is quite possibly my favorite CD of all time) is putting out a new album next month, and Thad is featured on 2 songs--one with Audrey Assad, another recent music discovery for me.